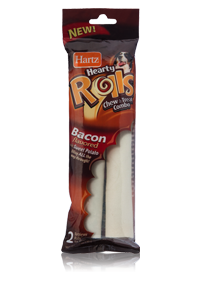 Hartz® Hearty Rolls™ keeps your dog happily busy with its extra hearty, chew & treat combo. The combination of satisfying rawhide chew and a layered sweet potato filling gives every bite the perfect mix of chew and delicious treat! It’s made to be enjoyed until the very last bite. Plus, the retriever roll shape makes it a favorite for large dogs! 2 Retriever Rolls for Dogs.